the Union ministry of coal has made it mandatory for mining companies to submit a mine closure plan to obtain lease rights. Coal mining companies will now have to submit a stage-wise mine closure plan initially and a final closure plan a year prior to the closure of the mine, as per the guidelines issued on September 28. In the past, mining companies submitted the closure plan as a part of their environmental management plan (emp) for clearance from the Union environment ministry. The coal ministry has now made it a mandatory part of mining proposals. The guidelines are meant to regulate the functioning of private companies that were allowed to mine coal for their steel and power plants a couple of years ago. 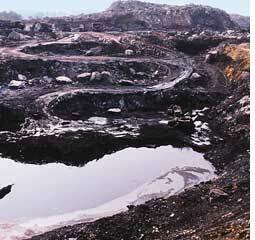 But it is the government-owned companies that are the real offenders, environment ministry officials said. "For instance, Coal India Ltd, a public sector undertaking, does not close its mines according to the submitted plan. The company uses strip mining (mining a layer of mineral by first removing a long strip of overlying soil and rock) as it is economical. The company mines a couple of strips on the surface and then abandons it to avoid high cost of deep mining and closure," an official said. Non-profits said the coalmine guidelines are a diluted version of the Minerals and Conservation Development Rules (mcdr) that govern non-coal and non-atomic mineral mines. The mines ministry provides for a regulatory body--Indian Bureau of Mines--that has the power to impose penalties and file court cases against companies. The coalmine guidelines also do not address disaster management, risk assessment and maintenance during temporary discontinuance of coalmines, said R Sreedhar of non-profit Mines, Minerals and People. The security money charged under the coal ministry guidelines is Rs 6 lakh per hectare. A report by V M S R Murthy and Gurdeep Singh of Indian School of Mines, Dhanbad, stated that mine closure costs are higher--large lignite mines in Germany cost hundreds of millions of dollars to close.